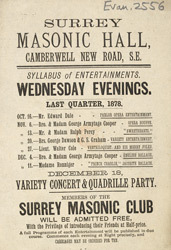 This leaflet is advertising an evenings entertainment at the Surrey Masonic Hall in Camberwell New Road. Masonry as it exists today began in London in 1717 at the Goose and Gridiron pub near Covent Garden. The first Masonic Lodge meetings were held in pubs, and the members of the society would stay for drinks and dinner after the meeting had finished. By the 19th century Freemasonry was frequently in the public eye. Reports of meeting appeared in the newspapers, there were processions balls and social clubs. Women were not invited to attend the meetings but annual dances were held to which wives were invited. Since 1776 the centre of Freemasonry in England has been the Freemasons Hall in Great Queen Street, London.